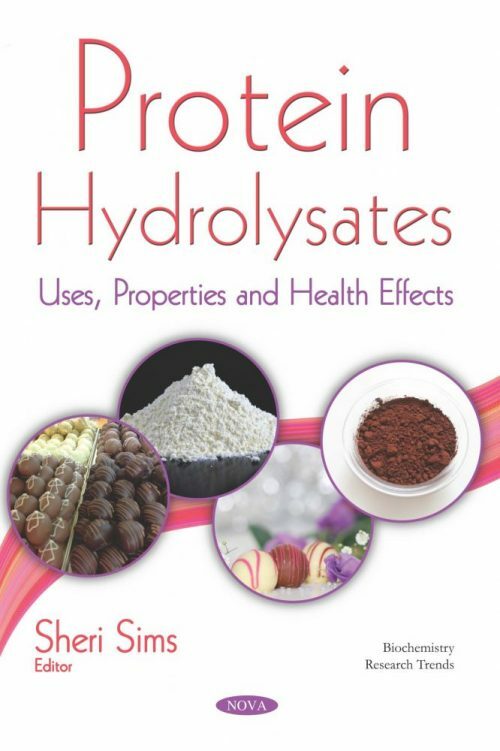 In this collection, the authors aim to provide information the preparation of marine protein hydrolysates and their main bioactive properties such as antioxidant, antimicrobial, antitumor and antihypertensive. Applications of these compounds in the area food technology and pharmaceuticals are also discussed. Protein Hydrolysates: Uses, Properties and Health Effects goes on to present some biological properties of fish peptides and their beneficial effects on health, emphasizing properties such as antidiabetic neuroprotective and anti-inflammatory, as a natural alternative to drugs and possible strategies to delay cognitive impairment. As confectionery manufacturers are trying to be innovative in producing suitable fat fillings for various applications. As such, the authors examine the functional, rheological and sensory properties of confectionery fat filling supplemented with different concentrations of bioactive whey protein hydrolysate powders, produced by enzymatic and microbial modification of whey proteins. Next, the bioactive potential of hydrolysate powders produced by enzymatic and microbial hydrolysis of whey proteins followed by spray drying is examined in order to determine which process allows for a highly bioactive production. A strain-substrate combination is introduced which allows for the production of dairy protein hydrolysates with high antioxidant activity and improved functional properties, which may be used as high-quality food supplements. The traditional methods for the production of functional peptides from biological sources are time-consuming and tedious. In the drug industry, it takes about five to ten years from the discovery of an industrial bioactive peptide to market delivery. To overcome the drawbacks of these traditional methods, the authors propose that a fast and versatile method is necessary. The concluding chapter presents an overview of the production and applications of bioactive peptides, demonstrating their potential use as helper agents of health processes. These peptides may aid in traditional health treatments since they can be used in high concentrations without associated toxic effects.